Event organizer Nate Miller addressed opponents of a proposed San Francisco Sit/Lie ordinance during a rally Saturday in the Castro. Photos by Luke Thomas. More than one thousand San Franciscans responded to a proposed “Sit/Lie” ordinance Saturday, staging creative protests on the sidewalks in neighborhoods across the city. As part of “SIDEWALKS ARE FOR PEOPLE”, participants held nearly 100 planned and spontaneous events, doing their favorite activities on the city’s sidewalks in protest to a proposed ordinance that would make it a criminal offense to sit on any sidewalk in San Francisco. 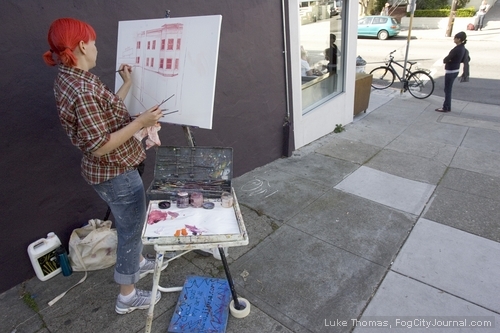 A San Francisco artisit used the sidewalk to paint a victorian-era building in Noe Valley. Events included tea and coffee parties, brass marching bands, brunches, art projects, barbeques, pirate radio broadcasts, beanbag tosses, yoga, karaoke, even a hot tub party. Event organizer Andy Blue said a proposed Sit/Lie law could be abused by law enforcement. Organizers say the events were so successful and fun, they plan to hold monthly ‘sit-outs’ the last Saturday of the month, at least until the ordinance is defeated at the Board of Supervisors and on the November ballot. 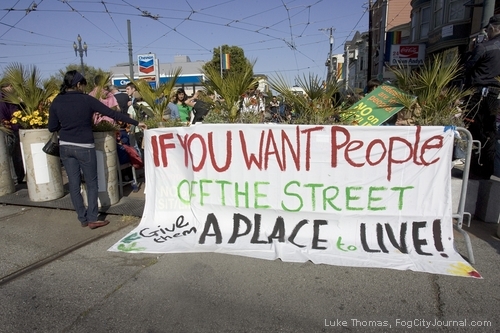 Comments for San Franciscans Protest of Sit/Lie Ordinance are now closed. The Haight has ample public parks – Golden Gate Park, the Panhandle, Buena Vista Park. Yet the nomadic addicts and alcoholics are flopped out on the sidewalks everywhere, claiming there is no other place to rest. The Haight has ample public trash bins. Yet the nomadic addicts and alcoholics throw their trash on the sidewalks everywhere, often while sitting right in front of a trash bin. The Haight has a free public toilet, easily accessible from most anywhere in the neighborhood. Yet the nomadic addicts and alcoholics crap and piss on the sidewalks everywhere. A sit-lie lie would help with all these problems. That’s because the nomadic addicts and alcoholics colonize public spaces and then use them as bases for flopping out, trashing, and crapping. And, of course, their ubiquitous drug dealing. The opposition to the sit-lie law has been late in forming and goofy in presenting its case. Even so, I expect that the margin of support for the measure will decline from its current high, but will still pass. A similar dynamic happened with Care Not Cash. The next step, after passing the sit-lie law, is to get a competent D.A. in SF. That’s the hard part. We haven’t had a first-class D.A. in living memory. Man I hope this passes. They are called sideWALKS for a reason. I pass at least 5 or 6 people blocking the sidewalk everyday just trying to get from BART to the office. Move along! Supporters of the sit-lie law, looking forward to the November ballot, are already making plans for aggressive fund-raising, conducting media campaigns on TV and elsewhere, and flooding pivotal precincts with absentee-ballot applications. 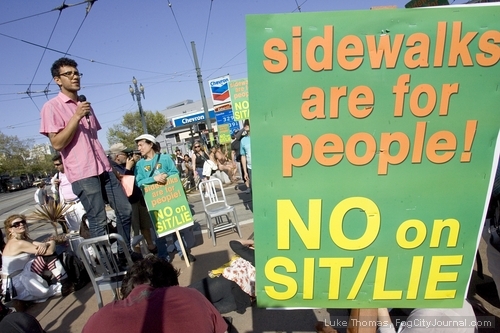 The Planning Commission recently voted to oppose Mayor Newsom’s proposed sit-lie law. The situation reminds me of the scene some years ago when Newsom, then a supe, first proposed his Care Not Cash initiative. The only people who supported it were the voters. The same will happen with the sit-lie law. Efforts are already underway by proponents of the sit-lie law to place it on the November ballot, assuming that the supes try to kill it, as also happened with Care Not Cash (see link below). Just as Care Not Cash helped determine the outcome of the mayoral race of 2003, so the sit-lie law will help determine the outcome of the supervisorial races of 2010. Candidates for supe who attack the sit-lie law, but who offer no practical alternative, will go down to defeat. Such now appears to be the likely fate of Debra Walker in district six and Rafael Mandelman in district eight. Candidates who oppose the sit-lie law, but who offer an improvement on its terms or a practical alternative, will have a better chance at the ballot box. But progressive candidates will have a hard time taking the more sensible route. The ideologues with a bunker mentality will denounce them as traitors if they do. In the meantime, the group “San Francisco Stands Against Sit/Lie” continues to delude itself into thinking that it has widespread popular support because it has won the plaudits of Homelessness Inc and progressive ideologues. This group would do well to reflect on the photo image of itself at last Saturday’s rally, as it appears in the current issue B.A.R. This image has boosted the morale of homeless advocates and progressive ideologues. But to many undecided voters, it looks like a still from a Monty Python flick. The sit-lie law is no panacea but a small step in the right direction. The underlying problem is that for years the city has provided services to the migratory addicts and alcoholics who flock here but with little or no accountability for their behavior. The result is that SF has become the big West Coast magnet for vagabonds in search of this special combination: easy access to drugs and lax law enforcement. In order to reverse the present magnet effect, the city will have to follow through with other needed reforms in addition to the sit-lie law. These include effective prosecution of the people who receive citations, which is almost non-existent now. Also needed is the creation of performance standards and public audits for Homelessness Inc. Many of these nonprofits are in a symbiotic relationship with the addicts and alcoholics. The city pours hundreds of millions of dollars into the nonprofits, yet most are as free from accountability as are the addicts and alcoholics themselves. 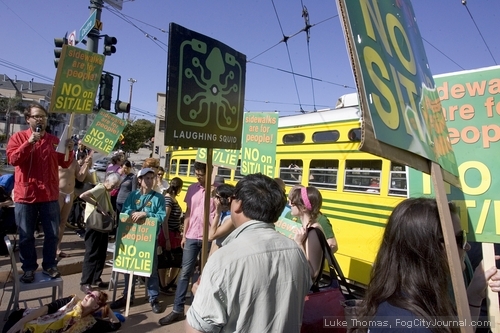 I saw the pic in the current issue of Bay Area Reporter of the evening rally last Saturday in the Castro by “SF Stands Against Sit/Lie.” The pic confirms what Luke Thomas’ pic shows: only about a dozen or so people participated in this culminating rally. However, organizers boasted that they had received more than 1,200 RSVPs for their events. Based on these claims, one would have expected hundreds of demonstrators to attend the culminating rally. In fact, the crowd consisted mostly of the usual suspects from Homelessness Inc. Opponents of the sit-lie law are in denial about both the magnet effect of SF for migratory addicts and alcoholics, and also their own popular appeal. Amazing! It appears that not only is Chief Gascón out of touch with San Francisco values but also out of touch with his own officers. The Sit/Lie deal is just a way to target the poor, period. There are laws on the books to deal with real crimes. Recently I listened to and read Jack London’s People of the Abyss, and encourage others to do so. Jack London’s descriptions of city poor and the way they were treated in England c. 1902 have some frighteningly close corollaries to 2010 San Francisco– especially his descriptions of the inability of the poor simply to rest. I wonder if those pressuring Police Chief Gascón to “do something anything” know the book. They should. btw… Could he do something anything about all those rich people who keep taking over whole city blocks– erecting tents and telling us to keep moving? Oh, I forget… a lot of those blowout cheese and wine functions raise money for the poor. I’m surprised to see the tactical mistakes being made by opponents of the proposed sit-lie law. Their principal response has been to deny that there is a behavioral problem with city’s migratory addicts and alcoholics, followed up by ad hominem attacks on the character and life of residents who dare to call public attention to this behavioral problem. Most San Franciscans roll their eyes at these tactics. They know from their own personal experiences that there’s a behavioral problem. They want to see practical solutions, not empty rhetoric. Opponents of the sit-lie law also made a mistake in overstating the size of their support. At their website, they claim to have over 1,000 RSVPs for their actions of this past Saturday. But if you look at the photos above by Luke Thomas of the culminating rally in the Castro, there appear to be only a dozen or so participants. Last week’s actions by opponents of the sit-lie law are an improvement over this earlier PR nadir. But even so, public opinion has now mostly hardened in favor of the ordinance. Opponents will have a hard time reversing this sentiment if they remain in a state of denial over the underlying behavioral problem. The old rhetoric won’t cut it anymore. Nate, I went to your website to post an event for Stand Against Sit/Lie. My event, Sit and Smoke, at 2nd and Market, appeared on your website for a few hours and then was removed. Why the censorship when your group clearly stated that any type of event was welcome? Well, how about having a debate with Luke Thomas? “Let’s face a little reality: People who live in certain areas of the city where vagrants, drug dealers and chronic inebriates are a problem, want law enforcement to have the tools necessary to deal with the problem. And in these difficult economic times, the problem is only getting worse. The sit-lie-ins were theatrical, got press coverage, and raised the morale of opponents of the proposed sit-lie law. But whether such actions will win over voters who are undecided about the law, or get supporters of the law to change their minds, is another question. There’s widespread disgust among San Franciscans with the behavior of the city’s many migratory addicts and alcoholics. These have become increasingly territorial and aggressive. They colonize public spaces, which they use as bases for drug dealing and a host of minor, and sometimes major, offenses. Many opponents of the sit-lie law deny the existence of this behavior problem and attack residents for daring to mention it. But every sensible person in the city knows there’s a problem. If opponents want to have a positive impact on voters who do not already agree with their views, they will have to move beyond theatrics. They need to offer a practical solution of their own to the behavior problem at hand. This will not be an easy task for them. In the past, they have called for more foot patrols as the answer. But foot patrols would be far more effective if they could walk with the sit-lie law. Why increase foot patrols and then cut off one of their feet? Other opponents have called for rescinding the two General Orders of the Police Commission requiring a formal civilian complaint for enforcement of laws against blocking the sidewalk. But these two General Orders are the result of a court settlement, which the Police Commission cannot unilaterally change. This obstacle neutralized an effort in the mid-90s, in which I participated, to have the Police Commission rescind the two General Orders. Another option might be to reframe the sit-lie law so that it prohibits certain specific types of behavior, in conjunction with sitting or lying, but allows everything else. This would be the opposite approach to the present proposal, which prohibits all sitting and lying, with certain exceptions. For example: No one shall sit or lie on the sidewalk while also panhandling, making noise, or playing a musical instrument. But the courts have upheld the constitutionality of panhandling in and of itself. So such a reframed law would immediately face a serious constitutional challenge. The currently proposed sit-lie law has emerged because all the alternative solutions have fatal flaws. Its advantage is that it will do the job and is based on a model that survived a constitutional challenge in the Ninth Circuit Court of Appeals, whose jurisdiction includes San Francisco. If there are better solutions, opponents of the current sit-lie law will have to find them and bring them into the public arena for discussion. It won’t do for them to continue to engage in theatrics and attack the motives of people who hold other views. Otherwise, opponents of the sit-lie law will find themselves in the same boat as did the opponents of Care Not Cash some years back. They will enjoy periodic episodes of euphoric acting-out and then lose at the ballot box.